New York City: What Is Your World War Two Story? 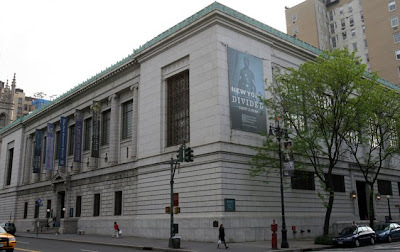 When the New-York Historical Society set out to create its WWII &amp- NYC exhibit, we knew that personal histories would be an important part of our presentation and our approach to soliciting visitor responses. Many visitors would have served on the home front or war fronts, or experienced the “War Emergency” as children. Others would have heard stories from their parents and grandparents. The war was a signal event in the lives of so many people, yet the New York angle has rarely been explored. “To capture these memories, we created the Talk to Us booth (it looks and feels like an old-fashioned phone booth) and a printed comment book (the pages resemble V-mail forms) so that visitors would have a choice of writing or telling their stories,” says WWII &amp- NYC curator Marci Reaven. So far New-York Historical has cataloged hundreds of responses, and new people are recording their stories with us every day. “We’re getting stories and comments in both formats, but the oral medium seems to be the best for drawing out memories of wartime experiences,” says Marci Reaven. This is not the first time New-York Historical has encouraged visitors to record their thoughts- for the duration of the Slavery in New York visitors were encouraged to leave video responses of their thoughts, and during Remembering 9/11, visitors could share their memories of that day in our guestbook. 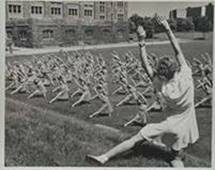 We’ll be featuring some selections on our Behind the Scenes blog for the duration of WWII &amp- NYC, on view through May 27, so come share your stories! 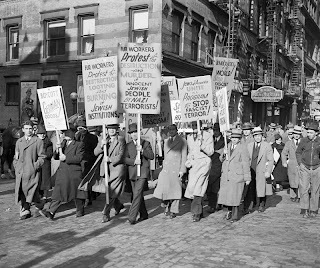 Photo: Jews at Nazi Protest Carrying Signs, November 15, 1938 (Courtesy Bettmann/CORBISand the New-York Historical Society). Many veterans did not talk about their WWII experiences and now it is too late because so many of them are gone.